The AdWords Keywords report gives data on the keywords from Google AdWords campaigns that are connected to the same Google Analytics profile as your Rank Ranger account. You will see which keywords are bringing in the most traffic and goal completions that you have set in your Analytics account. A Compare to Past feature allows you to include comparison data for the previous period, same time last year or a custom date range. Report data can be filtered by Key Metric (sessions, the percentage of new sessions, new users, bounce rate or pages per session), Segment and Goal Conversion type. Goal Value can be displayed in your choice of world currencies. Important! To view this report ,Google Analytics must be configured correctly (please refer to our Google Analytics documentation) for the primary domain. In addition, AdWords must be linked to your Google Analytics (see Google's instructions to Link Google Analytics and AdWords). This graph shows the results associated with the Key Metric you select (e.g., sessions, page views, goal completions, etc.). The orange line represents the comparison to the previous period. Analyze traffic metrics including the number of sessions, the percentage of those sessions that are new visits to the site, the number of new users visiting the site, the bounce rate, the average number of pages visited per session and the average session duration for visits the site. You can also view the change from a previous time period by selecting 'Compare to Past' with a date range in Report Options. By selecting to Display Goals in Report Options, you will be shown the Goal Conversion Rate, the Goal Completions and the Goal Value for the selected goal or the total for all your goals if All Goals was chosen. The Traffic Metrics table displays sessions, the percentage of new sessions, new users, bounce rate, pages per session, average session duration, goal conversion rate, goal completions and goal value per keyword. Note that in the bounce rate column, a lower number indicates a better rate, therefore, the downward arrow is green and represents a positive change. The AdWords Metrics table displays clicks, impressions, CTR (click through rate), Average CPC (cost per click) and Cost per keyword. The tables can also be filtered, which allows the user to narrow down what is shown within the table. 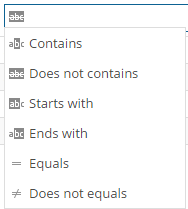 Check the Compare to Past box and select a period, if desired. If "Previous Period" is elected and the report date range is set to a 31-day month (e.g., July), and the previous month has only 30 days (e.g., June), then the report will include the last day of the month prior to that (e.g., May 31). This is the way the Google calculates the dates in their reports. We also offer a "Calendar Month(s)" option that compares each full calendar month in the report date range to the previous month(s). For example, if you select a report period of April 1 - May 31 (i.e. 61 days), the previous Calendar Months compared will be February 1 - March 31 (59 days), even though the total number of days in the 2 periods are not the same. As opposed to the "Previous Period" setting, resulting in a comparison period of January 30 - March 31 to match the 61 days of April 1 - May 31. The "Same Time Last Year" setting matches exact dates (e.g., January 1, 2018 - June 30, 2018 compared to January 1, 2017 - June 30, 2017). Sessions: the period of time a user is actively engaged with your website, app, etc. All usage data (Screen Views, Events, Ecommerce etc.) is associated with a session. 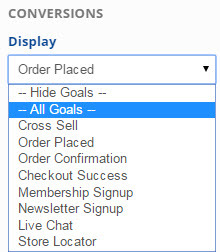 Specific Goals that appear in the list based on the goals you've set in your Google Analytics account. Choose to show or hide notes in the report. Due to the wide variety of options available in this report, we recommend using Report Presets which allow you to save a personalized version of a report or graph and create additional versions with different metrics, variables, and styles of that report or graph for the same campaign. Google Analytics API limits the number of requests from an IP address for a domain each day. If you see a screen in our Analytics section that displays titles but no data, it could be that you/your team have exceeded that threshold by multiple rechecks. Logging in from a different IP address or waiting until the next day should resolve the issue. Please contact us if the issue is not resolved within 24 hours.